Is your scrapbook mess draining your energy? Scrapbooking organization is the way to sanity if you refuse to live in a scrapbooking clutter. Avoid letting clutter become a problem as it can eat up your precious time that could be spent scrapping new pages. Getting organized is a priority on your list as your scrapbooking supplies expand and grow over time. 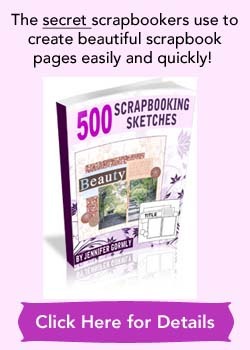 Do it now rather than later before your scrapbook goodies multiply and get out of control. “There must be another cardstock I’ve put away that matches this paper. But I just can’t seem to find it now when I need it!”. Save yourself this kind of agony. Organizing your zillions of supplies is a necessity, not a want. Chaos and messes take away your scrapping pleasure and time. So, start getting organized now! Scrapbooking organization can be broken down into simple and manageable steps. Just that you have to set aside some time to doing it. It’s usually not as time-consuming as you think. If you set aside too big a time frame to getting your scrapbook organization done, it’ll appear overwhelming and you’ll keep procrastinating this important task. A practical time frame will get you started quickly. That said, you’ll love it when your organizing is all done up. Just imagine the immense sense of satisfaction and pride welling up in you. 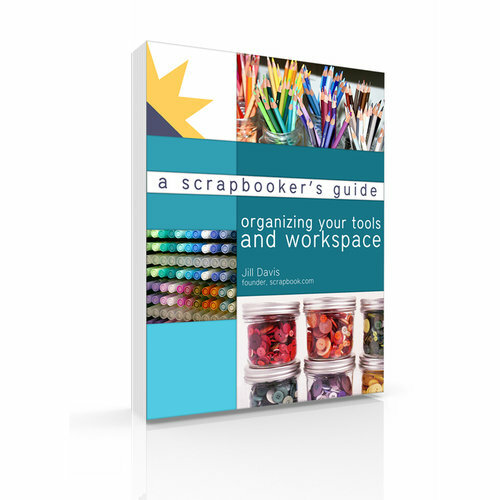 OK, if you need expert guidance on getting your scrapspace, scraproom, or scrapbooking life functional, here’s one e-Book you will enjoy. It shows you how to keep your cardstock, embellishments, albums, tools, pens, etc into clear organization. It helps you to create a space that’s reflective of your style. No matter how big or small your scrapspace is, you’ll be inspired and go away with great ideas from Jill Davis, the founder of Scrapbook.com. She shares many, many ideas on storage solutions for scrapbook supplies and tools. You’ll also get sneak previews into her personal scrap studio. There’s many good reviews on this ebook. If you have no idea on where to start and want to stop wasting precious hours bothered by chaos, let Jill guide you to a well-organized scrapping haven. You’ll probably need a large floor space if your have a huge collection of supplies. To see everything at a glance, spread them all out on the floor. Sort according to categories like papers, brad, eyelets, tags, stickers, punch art, etc. If you desire, you can also sort within categories. How about sorting your stacks of papers into different families of colors? Or your hundreds of eyelets into various colors? Your brads into different shapes? Sort according to what you think works best for you. Be a little hard-hearted and get rid of those supplies that you won’t need, once and for all. Sometimes it’s kinda tough for you to look at those yesteryear stickers and convince yourself that you’ll use it someday. The thing is, you probably won’t need it and it’s taking up precious space. Clearing away those items you don’t need will make room for your new supplies. Isn’t that more fun? Furthermore, your old supplies can have a chance at a new lease of life as another scrapbooker’s treasure. Hint: organize a swap with your friends or cropping buddies. Get a box and fill it up with items that you wanna donate or give them away. Doesn’t it make you feel good when you can give away something that others might love? 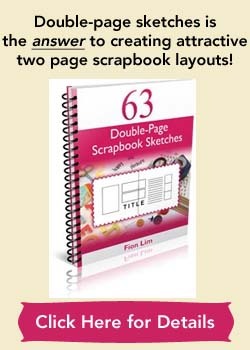 Set up a space for your scrapbooking activity. It may be a closet, a corner at your house or if you’re lucky enough, a whole room to yourself. Whatever the space, designate it as your scrapbooking corner. After sorting through all your supplies, now it’s the time to consider where to house them. One consideration is how often do you use these supplies? Place frequently-used items close to where you work, and you may put aside those seldom-used items to another part of your room. 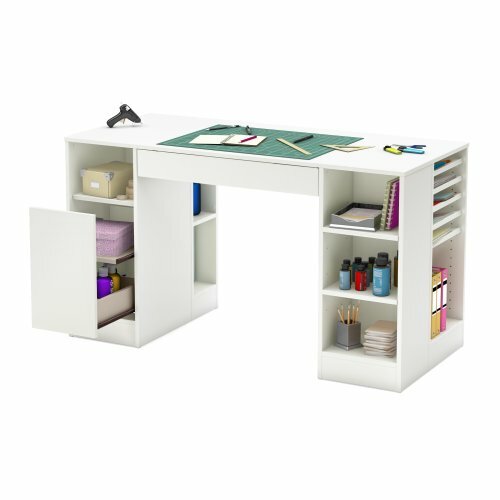 For a creative and very functional way to combine both workspace and a storage solution, you have to check out this beautiful craft table that’s inspired by the needs of scrapbookers. Now it’s the time to pour your supplies into their homes that you’ve chosen for them. See how prettily the various containers are filling up with your supplies. Do you feel your sense of satisfaction growing? Print or neatly handwrite labels for your containers, drawers, shelves, etc. With your supplies in their homes and labels pointing out their exact locations to you, searching for your supplies is now a breeze. Give yourself a pat on your shoulder for completing such an important and big task of scrapbooking organization! Now that you’re done, the last thing you want to do is to mess it all up again. To avoid this, spend 5-10 minutes after each scrapbooking session to put back each item to its place. This habit will help you maintain a neat and tidy scrapbooking haven. Would you like some suggestions on what scrapbooking storage systems and organizers to consider? Take a look at these beautiful, functional storage items that flagged my attention at Scrapbook.com! I think they not only look great but come with great reviews too!